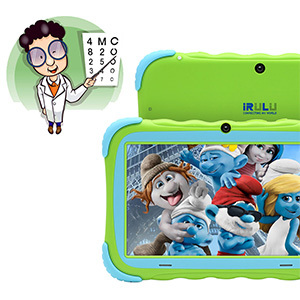 With its bright 7-inch screen, colorful bumper case, and long-lasting battery, the iRULU Y57 is ideal for kids to play and learn. 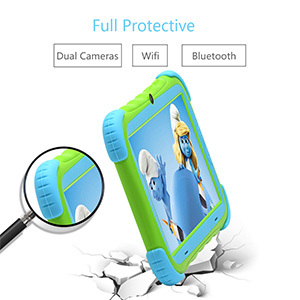 This tablet includes some apps and makes it easy for your child to explore games and books. Just log into Play Store and download free Android apps. Fit for the child age and ability well, can be switched to assist their study and to rich spare time life. 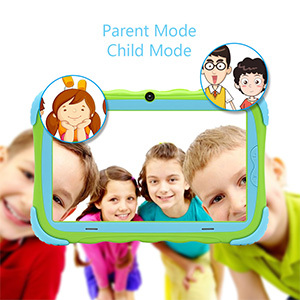 Kids can enjoy the tablet with parental controls in place, which gives free access to know more about your kids. 1024*600 IPS resolution delivers bright colors and crisp pictures. Google Android 7.1 operating system offers high speed and responsiveness to run educational apps and to play popular puzzle games. 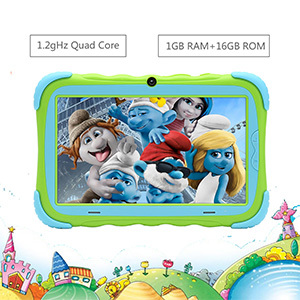 GMS Tested This Y57 7" Kids Tablet is GMS Tested by Google to ensure consistent quality, reliability, and maximize privacy protection for secure browsing and communications. Provides a high standard in security that many Androids today do not reach. You can use the following APPs safely: *Search *Search by Voice *Gmail *Contact Sync *Calendar Sync *Talk *Maps *Street View *YouTube *Play store And many more! The internationally recognized GMS gives you peace of mind in the U.S. and abroad. Running on Android 7.1 System Runs on the latest Android 7.1 Quad core 1.2Ghz, has 1GB RAM and 16GB internal Storage, it's possible to run a variety of entertainment apps fluently. Perfect choice for entertainment and education. Front 0.3MP,Rear 2MP, there's more to share. Take videos, snap more clear pictures with the 2.0MP rear camera and easily post them to FaceBook and Twitter. Improved Wi-Fi module enables you experience faster loading speed for browsing the web, streaming music, making video calls and more. Best gift for Christmas, New Year, Easter and Birthday. The tablet will meet all you needs and you will love it.